Finding old magazines, really old magazines, that are intact and readable is a researcher's treat. The old book and magazine section is the first place I head when I visit an antique, thrift or second-hand store. 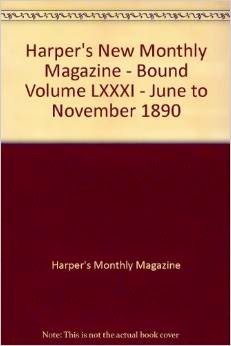 Several years ago, I found six hard-back bound volumes of Harper's New Monthly Magazine. I was overjoyed to say the least. I had been researching the years 1889, 1890, and 1891. You can imagine my delight when I found these six volumes. They contain vintage pictures, copies of now famous artwork, articles about exotic places, plays, novel series, jokes, poems, cartoons, Editor Corners, Monthly Record of Current Events, and much more. Reading the stories my hero and heroine would have read in their parlor by lamplight was thrilling. It was fun imagining them reading about the foreign countries, strange cultures and customs, talking about the new artwork and stories we now designate as significant contributions to the art and literary world. 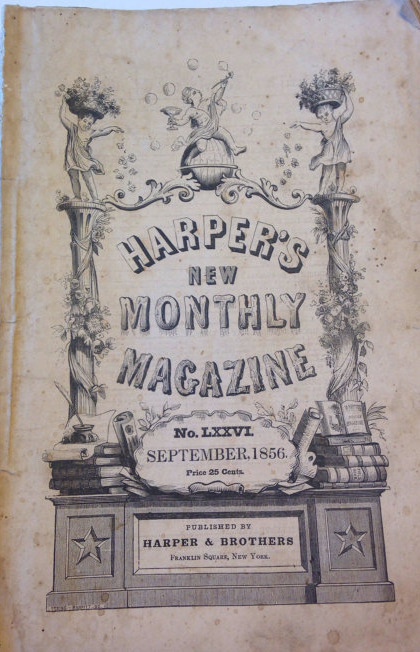 The first issue of Harper's New Monthly Magazine was published in June, 1850 (Volume 0001 Issue 1) by Harper and Bros, New York. It was published monthly for three dollars per annum. "The design of the Publishers, in issuing this work, is to place within the reach of the great mass of the American people the unbounded treasures of the Periodical Literature of the present day." Some of the articles came from other publications such as Bentley's Monthly Miscellany, Dublin University Magazine, The Ladies' Companion, and Household Words, to name a very few. The Magazine includes quarterly reviews of both Great Britain and the United States, speeches and addresses of distinguished men upon topics of universal interest and importance, economy of social and domestic life, and a fashion plate. 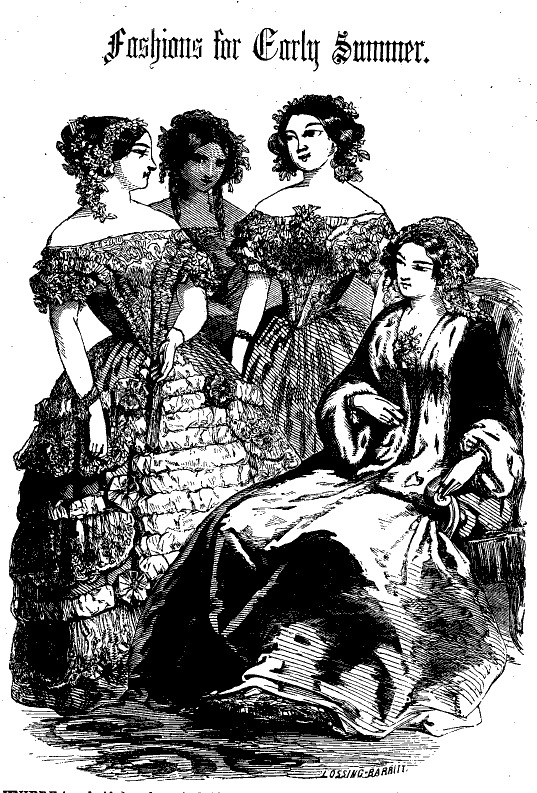 The language, descriptions, and word choices are enchanting as shown in the description of the Fashions for Early Summer (pp. 142-144). "There is a decided tendency in fashion this season to depart from simplicity in dress, and to adopt the extreme ornamental elegance of the middle ages. Bonnets, dress, and mantles are trimmed all over with puffings of net, lace, and flowers. A great change has taken place in the width of the skirts, which, from being very large, are now worn almost narrow. Ball dresses a tablier (apron trimming, as seen in the erect in the erect figure on the left of the above group) are much in vogue, covered with puffings of net. 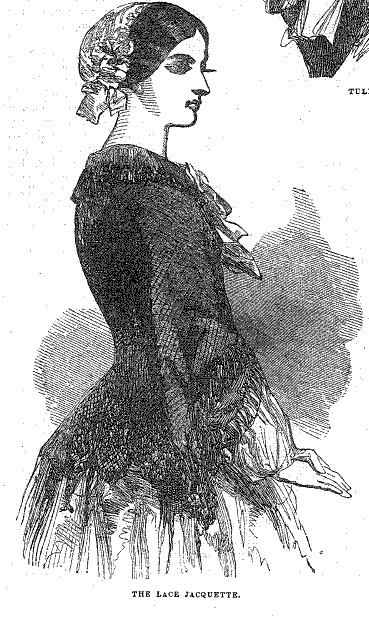 The three flounces of lace, forming the trimming of the bottom of the dress, have all a puffing of net at the top of them; the whole being fastened to the apron with a rosette of ribbon. "A precious gem is sometimes worn in the centre of the rosette, either diamond, emerald or ruby, according to the color of the dress. Nearly all of the sleeves of visiting dresses are Chinese, or "pagoda" fashion. 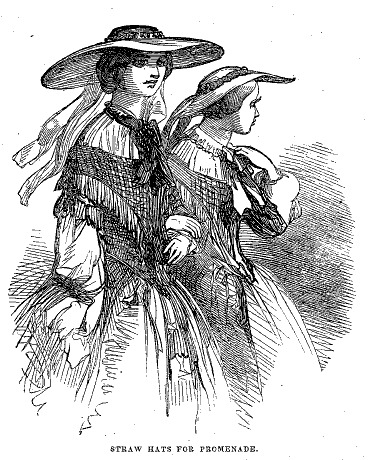 Broad-brimmed straw hats are used for the promenade; open-work straw bonnets, of different colors, are adopted for the earlier summer wear, trimmed with branches of lilac, or something as appropriate. 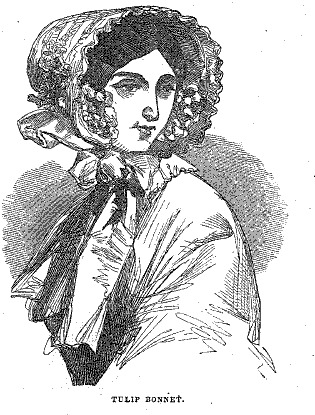 "Crinoline hats of open pattern, trimmed generally with a flower or feathers, are worn to the opera. There is a style of walking dress, worn by those who have less love for ornaments." I could go on and on for six whole annual compilations, but I'll let you select your own volume, and stories, to read. Cornell University Library has developed the Making of American series. 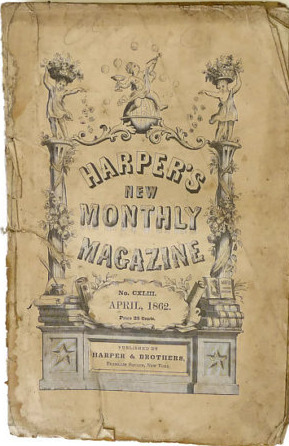 You can browse 98 of Harper's New Monthly Magazine volumes from 1850-1899 at http://ebooks.library.cornell.edu/h/harp/harp.html. More are expected to be added. It reminded me of our current day National Geographic - http://www.nationalgeographic.com. It's formerly The National Geographic Magazine, the official magazine of the National Geographic Society. It has been published continuously since its first issue in 1888, nine months after the Society itself was founded. The Society is considered one of the largest nonprofit scientific and educational institutions in the world. It, too, has interest in geography, archaeology and natural science as well as environmental and historical conservation. A commentator recently said that we're living in the Lost Information Age. His contention was that the written word is being digitized at such a rapid rate that we are throwing away volumes of print materials. He was afraid that a power serge, hacking, or electrical grid failures would cause us to lose centuries worth of valuable information. What do you think? Is the digital media doing us a favor or setting us up to be at a loss for words? Lin writes historical fiction set primarily in the 1890s. In Christmas Gold, the last thing Eleanor Masters, a confirmed city girl, has to worry about on the 1890 Texas ranch is fashion. The city-perfect clothes are still in the wardrobe as she learns to ride western-style and lead a camel. Lin enjoys history that is steeped in daily living. She and her husband, Jerry, live on a hay and cattle ranch in Chimney Rock, Colorado. Digital media has set us up for a loss of words. It has numbed our minds. Hi, Caryl, thanks for stopping by. I've been in St. Louis for the ACFW writers' annual conference. You're right - the digital age has dumbed us down. I think the digital world is harming our written word. The written word in the form of thank you notes and letters is becoming a lost art. This saddens me! Howdy, Melanie, good to see you again. Yes, I agree, it is sad. Digital has made us forget about the more genteel ways of communicating. I send cards, notes, and letters by post and always get a thank-you for the written word. Most are surprised, pleased but surprised. It's amazing to think that future generations might not have as much information about us as we have about our ancestors. Most magazines seem to be on the way out, and newspapers are really having problems keeping subscribers. I can remember as a teenager looking through stacks of National Geographics that my parents saved. I have no idea what happened to all those magazines! Hi, Donna, good to see you again. Many magazines are getting thinner and dominated more by advertisements than information. They have become almost a catalog of vendors. A lot of thrift shops are just pitching magazines, even the popular ones like National Geographic. I'm dreading the day when hackers cause us to lose these precious resources. I cherish the older copies of magazines I've been able to find and am thrilled that some are now available online. I remember the good old days of research when the internet didn't exist and constantly remain amazed by what's available at the click of a few keyboard keys. But I also agree with Caryl, Melanie, and Donna, about the problems with the digital world. I've been especially concerned about how the different types of learning affect brain function and formation. I don't think enough studies have been done on that, especially with children ... but still our schools continue to transfer learning to tablets instead of books. I'm not sure that's a good idea. More studies need to be done on how that type of learning affects critical thinking skills and other vital brain function. But finding Peterson's available online? WONDERFUL. Nothing helps me understand how my characters think and act like reading what they read. Hi Stephanie, boy do I remember those early days of research. That may be why I have withdrawal symptoms when we pass second hand and antique stores, plus small town libraries and we don't have time to stop and browse. My husband is a retired teacher, our daughter still a teacher, and they both have noticed the decline in reading and in expressive writing. It is rather thrilling to think of our characters sitting down to an evening of reading after supper and to read along with them. I apologize for being so long in replying. I've been in St. Louis for the ACFW - American Christian Fiction Writers - annual conference. Hi, Heidi, I, too, am partial to the tactile. There have been times, I felt a shiver when picking up an artifact or antique book, almost expecting to be transported back in time. I have a lot of e-books, but prefer print. My husband asked if we could down-size our life. I'm not looking forward to doing that in my library. I need to invent a head cover for my iPad so I can read during really sunny weather on a trip. That's when print trumps e-books. I believe digital media is doing a little bit of both good and bad. What I dislike about the pics is that they shrink the pictures and it's very hard to see them. But also it's just nice to hold a book, turn the actual pages as well as smell that awesome book smell! However, e-readers are much easier to travel with, easier to carry around, hold hundreds of books rather than a small handful, print can be enlarged, I can keep going ad infinitum. I personally love each for many reasons other than those listed. It's truly a double edged sword. 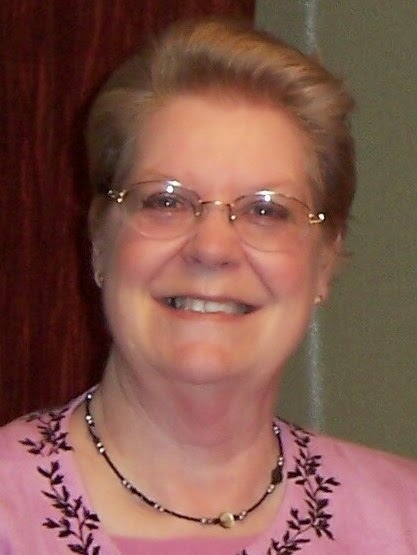 Hi, Kristen, I'm learning to appreciate my Kindle and Nook more and more. My disadvantage is not being able to read in the car on a bright day in Southwest Colorado. I have enjoyed the advantage of saving my manuscripts in progress into a PDF format and sending them to the Kindle so I can do read throughs looking for things needing expanded/cut/corrected, etc. I need to invent a head cover or a nesting box for my iPad so I can read during really sunny weather on a trip. That's when print trumps e-books. I agree with the point of easier to travel with and holding so many books, But every time we get something new we leave another behind. That I don't like. And my rules in my Kindle says it can damage your eyes. Never read that in a book. Some bookstores have had to close because of the ebooks. That is sad. I really prefer the print. I love to go look in Bookstores. I mostly use my ebook for the free books. I would love to win one of these fantastic prizes. Hi, Maxie, I'm partial to the free ones also. I scan through Amazon's freebies about once a week. Found some books from authors I wanted to read, but can't afford $20-25 print book. That's been profitable because I've found some authors I will now buy their print books. I belong to BookCrossing.com - dubbed the World's Library. After I read a book that I can force myself to let go of, I register it in the bookcrossing database, put a bookplate label in the front, and leave it in an appropriate place that would encourage a person to pick it up and take it along. If they follow through and go to BookCrossing.com and look up the ID number and add a comment about their location, etc., then leave the book for another person, the book can be followed all over the place. I've had book find their way to China, and Mexico. It's a lot of fun, and I don't feel so bad about turning loose of books.